Tomorrow Asteroid 2005 YU 55 will pass the Earth closer than the moon, a 1,312 foot chunk of rock slipping by a mere 201,000 miles away. For scientists it presents an excellent opportunity to study near-Earth objects. 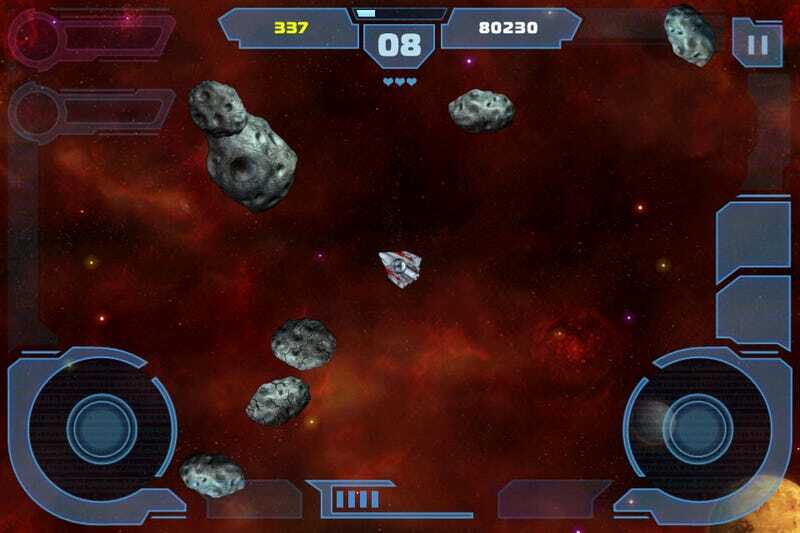 For Atari it's an opportunity to market their new free-to-play iOS game, Asteroids Gunner. Asteroids Gunner takes the classic Asteroids gameplay retools it into a twin-stick shooter for the iPhone, iPod Touch, and iPad. At its core it's still the same game we've been playing since 1979; you pilot a ship tasked with breaking large asteroids into smaller bits, clearing one stage and moving onto the next. What's changed is now the asteroids contain power-ups as well as crystals that can be used to upgrade your ships. Players can also purchase Space Bucks (seriously) to unlock new galaxies and more powerful upgrades. I've been fooling around with a copy of the game on my iPhone, and it's pretty nifty in an old-school plus sort of way. I can't see myself ever shelling out real money for Space Bucks, but I'm sure there's somebody out there willing to part with their hard-earned money in order to destroy more virtual asteroids. Asteroids Gunner is coming soon to the iTunes App Store, unless we all die tomorrow.